No one can argue that we love a good bath bomb, but if your wardrobe is as black as your soul, then you might as well get a bath bomb to match. Online shop Harper Homemade has the perfect skull-shaped bath bomb named “Poser,” and we’re currently obsessed. Watch as the silver skull turns black and blue right before your eyes in the video below. If you’re looking to bring a Halloween-esque party to your bathtub, you will have to wait a few days to make your dreams (or nightmares) a reality. Although the bath bomb is currently unavailable, Refinery29 reports that the brand will be restocking the beautiful skull bath bomb on March 1. So turn on our essential obscure goth playlist to get in the mood and let the skull bath bomb do the rest. While you're at it, find out who your goth style inspiration is by taking our quiz to see whose style you're most influenced by. 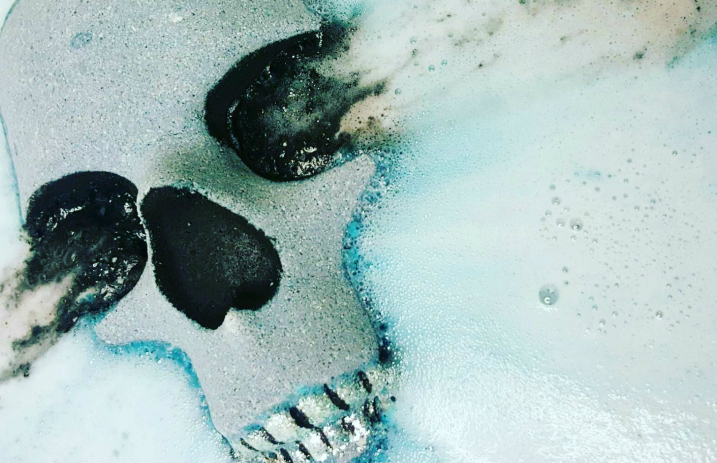 Will you be picking up this terrifyingly amazing bath bomb? Let us know in the comments below!